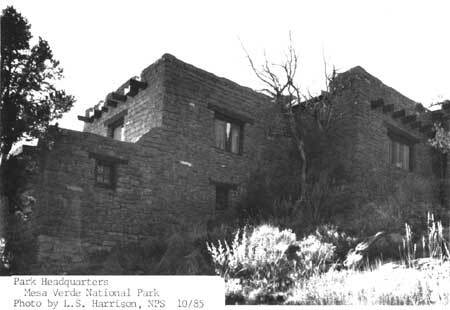 Park Headquarters, Mesa Verde NP, 1985. Included in this Landmark nomination for the Mesa Verde Administrative District are the superintendent's residence, the post office, the park headquarters building, the old community building (now the ranger station), the museum, and the ranger club (now the park library). All of the buildings are constructed in the pueblo revival style, although many of the details of these structures are derived from prehistoric sources rather than historic ones. The structures are near the edge of Spruce Tree Canyon on the top of the mesa in a fragrant pinon and juniper forest. These six buildings contain a series of common architectural elements that characterize their style. The principal building material of these structures is sandstone, some of which was reused from prehistoric structures. The stone is usually laid in courses with mud mortar nearly flush with the stone, giving the walls a relatively smooth appearance. The walls have a slight batter and average 18 inches in thickness. Parapets surround the flat roofs of the buildings. The load-bearing walls support simple roof structures of peeled beams (vigas) which protrude through the masonry to the exterior. The vigas on the interior support half-round saplings or split-wood slats (latias) with cedar bark above. The latias in these buildings are for decorative purposes, since a wood decking and built-up roof are the true sheltering portions. The irregular building plans for these simply engineered structures result directly from the shapes of the rooms and their configuration. This "form-follows-function" method of building is typical of both prehistoric and historic pueblo structures, and is used quite appropriately in these revival structures. Larger pieces of woodwork on the buildings--lintels, squared beams, doors, and the like--have adz marks adding texture and a pioneer type of character to the buildings. Interiors have plastered walls, corner fireplaces typical of the southwest, and sometimes flagstone floors and built-in bancos (benches). Pierced-tin lighting fixtures based on Spanish-Colonial and Mexican designs further contribute to the exotic feeling. The oldest of the buildings is the superintendent's residence completed in 1921. The stone structure is sited at the edge of the rim of Spruce Tree Canyon. The building evolved in three major stages, starting as a four-room residence in 1921. An addition in 1928 created two new guest rooms, and a third remodelling during the 1930s added a portal, another bedroom and bath, and a study. The building s stone walls contain some stones used in prehistoric structures--discernible by their pecked markings. A T-shaped doorway in the basement wall replicates the form common to prehistoric Anasazi structures, and recalls the building's cultural ties. The residence contains several additional interior features of note besides the characterizing elements listed above. Some of the rooms in the residence have exposed vigas with coved plaster between then rather than the usual ceiling treatment. The mortise-and-tenon interior doors are particularly well constructed, and two have sawn grilles for their upper portions. The plaster walls have smooth, bullnosed corners. Other than the additions which are considered part of the historic period, changes to the structure have been minimal. Aluminum sash windows replaced the original wooden ones in 1963. The original front door has been replaced. The roof over the portal was reinforced with steel to improve its structural capabilities in 1984. The administration building (1923) began as a small, three-room structure north of the superintendent's residence. Two additional offices were added five years after construction of the original building, and a major addition in 1939-40 resulted in the construction of more offices, a file room, furnace room, and employee restrooms. The building now contains approximately 2000 square feet of office space on the first floor and nearly 700 in the basement. Some of the stones in the masonry walls show peck marks, indicative of prehistoric use in a structure. The main entrance to the structure is through a large portal on its north elevation containing many of the characterizing stylistic elements. The posts supporting the roof structure are topped with zapatas (corbels) cut in zig-zag patterns of Indian design. The adz marks, readily visible on the shaped timbers of the portal, add texture and a hand-crafted, pioneer feeling to the building. The portal's ceiling is made up of exposed vigas and latias. A small portion of the adobe plaster that partially covered the portal walls remains intact. An additional portal on the west side of the building at the basement level provides access to that lower level. The interior of the administration building retains some original elements characteristic of the style--corner fireplaces, exposed vigas, log lintels over windows and doors, and some original furnishings of Spanish-Colonial design. Changes to the interior are primarily to cosmetic finishes. Most of the floors are carpeted. Some of the ceilings are now suspended ceilings with fluorescent lights for better office illumination. Original wood-sash windows are gone, replaced by aluminum sash in 1963. The post office (1923) is a small structure tucked away in a tiny niche in the staggered levels of bedrock west of the administration building. Originally constructed as a comfort station, the building was elevated to the post office function in 1936. Access into the structure is through a small portal with a small banco on one side and edged by a low, stepped wall. The wooden entrance door and the wood-frame windows are original. The interior walls are painted plaster, and floors are concrete. The lobby area has the original exposed viga-and-latia ceiling and a wall of post office boxes dating from 1936. The small writing desk attached to the wall has been restored and newer Mexican tin lanterns replace the originals. Sheetrock now covers the original ceiling materials in the office and work area behind the business counter. Like the administration building, the museum's structural history is an evolution that began with a small building. The original building (1923-4) was greatly expanded in 1936 resulting in the present plan that includes an entrance lobby, library, six exhibit halls, a large auditorium, offices, a classroom, research and study room, and storage and mechanical equipment space in the basements. The large structure now contains approximately 9,300 square feet on the main floor and 2,700 in the basement. Exterior elements of the large, rambling structure are characteristic of the style. The building retains most of its original wood-sash windows, some decorated with saw grillework. The public entrance to the building is sheltered by a large, L-shaped portal that has a flagstone floor, viga-and-latia ceiling, and restful benches of Spanish-Colonial design. The exhibit rooms, lobby, and bookstore on the interior have scored-concrete floors, exposed vigas and latias, built-in bancos along the thick walls, and pierced-tin chandeliers. The exhibit rooms are constructed on several different levels separated by steps, reflecting the structure's s simple response to the topography. Most of the rooms contain furnishings of Spanish-Colonial design. The most noteworthy of the interior spaces is the auditorium. Constructed in a configuration vaguely reminiscent of Spanish-Colonial churches in the southwest, the room has a high ceiling, a rear balcony (choir loft), and a centered entrance of double door leading in from the exterior. The room's symmetry and careful detailing are similar to other auditorium spaces of the time such as St. Francis Auditorium and the auditorium at the School of American Research in Santa Fe, or the largest room in the museum/visitor center at White Sands National Monument. The peeled log posts supporting the balcony are finished smooth, while the corbels and enormous bean above have the mottled texture of adz marks. The sawn railing of the balcony and staircase leading up to it have similar adz marks. The ceiling treatment in this room is more decorative than that of the other rooms. The principal vigas support large latias which in turn support small latias running parallel to the main vigas. Another important space in the building is the small central courtyard. Access into the courtyard is through French doors from one of the exhibit rooms. The courtyard contains flagstone walkways and planted islands of native vegetation. Besides being a comfortable outside space the courtyard allows natural light to filter into some of the exhibit rooms. The office spaces of this building have undergone the greatest alteration, although most of these changes have been cosmetic and in the nature of carpeting, periodic painting, and temporary partitions. Other changes on the interior include a relatively new central heating system, and track lights to augment the original lighting fixtures. The ranger club (1925) is northeast of the museum building on the opposite side of the road. Constructed on a relatively flat site, the building seems taller than the others because its front elevation steps up above grade. Like the other buildings, the stone walls are slightly battered, the roof is flat and surrounded by a parapet, and the viga ends extend out from the exterior walls. Entrance to most of the other structures of the group is at grade or stepped down from it. Access into the structure is through a recessed porch on the front elevation. The building began as a small structure to house unmarried rangers during the summer. Additions made to the structure in 1928, 1929, 1932, 1934, and 1952 have resulted in the plan as it exists today. The original main block of the building has a large U-shaped addition at the north, surrounding a small patio. The front portion of the building houses the areas used as public spaces--living room, kitchen, and dining room--and the "U" houses the area used as the sleeping porch. The building presently is undergoing a partial interior restoration (the public areas) and rehabilitation (the sleeping porches and remainder) to accommodate new functions. Other changes to the building include the installation of aluminum sash during the 1960s and the restructuring of the sagging entrance porch roof in 1984. The last of these structures is the community house/natural history museum, now used as the chief ranger's office. Begun in 1927, the building originally contained only one large upstairs room, a rear portal overlooking Spruce Tree House, the Anasazi archeological site across the canyon, and a partial basement. In 1936 the basement space was turned into a comfort station, and in 1940 the first floor became the natural history museum. The first floor was turned into office space for the park rangers in 1968. Today the building retains considerable integrity on the exterior. The portal overlooking the enormous cliff dwelling on the other side of the canyon remains a favorite spot for visitors to rest or take photographs. The hand-made benches are well-used all seasons of the year. The stone floor, viga ceiling, and zig zag corbels again create spatial character and add to the quality of the quiet interpretive experience the portal provides. The interior of the building retains some historic fabric, although the room configurations are modified from the original. The load-bearing walls retain their smooth plaster finishes and the adz-finished lintels, doors, and beams remain. The chief ranger's office contains the corner fireplace which originally warmed the single large room. The partitions are portable or easily removable and have done very little damage to the historic fabric. Also included in this nomination are the various landscape-architectural features contributing to the character, atmosphere, and ambience of the area. The paved walkways and stone steps bordered by low stone curbs meander among the buildings and provide small, intimate vistas in keeping with the small scale of the structures. The planting islands of native vegetation around the buildings, also edged by stone curbs, screen the structures from the hot summer sun and make the buildings seem indigenous to their surroundings. The concern for these simple architectural features in the landscape is identical to the concern for detail and aesthetics emphasized in the design of the buildings. These core structures at Mesa Verde--the superintendent's residence, park headquarters building, post office, ranger club, museum, and community building--are the first National Park Service structures to experiment with architectural designs based in strong cultural traditions. They are excellent examples of the pueblo revival style, in this instance modified to reflect and enhance the interpretation of the prehistoric structures of the surrounding countryside. When the National Park Service was established in 1916 as the bureau to manage national parks, the new agency absorbed an architectural legacy developed by private interests, particularly the railroads. At Yellowstone the best of that legacy was the Northern Pacific's Old Faithful Inn. The Atchison, Topeka, and Santa Fe Railway developed a destination resort at the south rim of the Grand Canyon that included a creative variety of buildings such as the Norwegian-Swiss of El Tovar, the archeologically correct Hopi House, and the medieval-feeling Hermit's Rest. The Great Northern Railway constructed a series of enormous hotels and backcountry chalets, all following the Swiss chalet style. The newly-formed agency had review and approval authority over all new construction in the national parks, whether built by private interests or by the service itself. Among the tasks faced by the agency was developing park service facilities in national parks which would support better agency management of the areas and encourage the ever-important tourism. Appropriations for managing the areas were directly proportional to visitation figures. Mesa Verde became a park in 1906 and it was not particularly well managed in its early years. Early administrators often ignored the looting and vandalism in the ruins, or else profited financially from it. The rocky administrative history of the park resulted in the Director's appointment of an archeologist, Jesse Nusbaum, to oversee management of the archeological resources and development of the area in 1921. The directorate approved Nusbaum's architectural choices. The designs obviously harmonized with the surrounding landscape and showed a true concern for the "aesthetic values of park lands." His buildings were the first constructed by the new agency to solve the problem of an appropriate architecture for park lands set aside for their cultural resources rather than their natural resources. Nusbaum based his architecture on the cultural traditions rather than looking toward the park's natural resources for design ideas as other park managers had. Nusbaum remained Superintendent at Mesa Verde until 1931 when he left to become the director of the Laboratory of Anthropology in Santa Fe. Even after his departure he remained an archeological consultant to the National Park Service, and retained particularly strong ties with Mesa Verde. After 1931 he reviewed all of the construction drawings for additions and alterations to the buildings he designed. He brought in his friend, southwestern architect John Gaw Meem, to help with the reviews of the proposed alterations, then prepared by the park service's s Branch of Plans and Design in San Francisco under the capable direction of Thomas C. Vint. Even though Nusbaum was no longer at the park he still guided construction of the additions; he sent frequent memos with copious notes about minute architectural details to the new park superintendent and the design team. His influence pervaded the design of the new construction. Looking beyond Nusbaum's impact on Mesa Verde architecture to his impact on subsequent park service design and even in the mainstream of American architecture, his contributions are noteworthy. When he constructed the administrative buildings at Mesa Verde a handful of pueblo-revival structures did exist, but even in Santa Fe--famous for its pueblo revival structures--it was not the architectural style of choice. His choice of a style derived from local cultural ties rather than from mainstream architectural styles or experiments in logs and stone was a first for the National Park Service. These, then, were the first structures built by the park service emphasizing a cultural theme. The use of variations on this style became the norm in the quickly developing southwestern parks and monuments in the 1930s. 1 National Park Service, Report of the Director of the National Park Service. (Washington, D.C.: Government Printing Office, 1918), p.274. 2 T. Stell Newman and Harold LaFleur, Mesa Verde Historical Administrative District: An Architectural and Historical Study (Denver: National Park Service, 1974), p. 20. Mesa Verde National Park files including Public Works files, List of Classified Structures background files, and others from the research center. Newman, T. Stell, and Harold LaFleur. Mesa Verde Historical Administrative District: An Architectural and Historical Study. Denver: National Park Service, Denver Service Center, 1974. Rocky Mountain Regional Office files including building inventory files and List of Classified Structures files. Torres-Reyes, Ricardo. Mesa Verde National Park: An Administrative History. 1906-1970. Washington, D.C. : National Park Service, 1970. The boundary, as shown on the enclosed map, begins at a point 20 feet southwest of the southwest corner of the post office, then proceeds east running parallel to and 20 feet out from the south wall of the post office; then south running parallel to and 20 feet out from the westernmost wall of the superintendent's residence; then northwest approximately thirty feet to a point 25 feet from the southern corner of the administration building; then traversing along the canyon slope at the 6,940-feet contour approximately 25 feet behind the community building and 45 feet behind the museum to a point 75 feet northeast of the northeast corner of the museum building; then west running parallel to and 20 feet north of the north wall of the museum to a point 10 feet east of the east road edge; then north approximately 190 feet; then west 180 feet; then south 180 feet running parallel to and 20 feet out from the west wall of the ranger club; then approximately 150 feet east to a point 10 feet west of the west side of the road edge; then running in a south-southwesterly direction staying 10 feet west of the road to a point across from the intersection of the main road and the post office access road; the crossing the main road and running 10 feet south of and parallel to the south side of the access road to a point 20 feet northwest of the northwest corner of the post office; then running south in a straight line to the starting point.